I have always been a huge fan of products that can be personalized to fit someone’s unique style or story. With Origami Owl jewelry you can create truly unique and one of a kind jewelry pieces, known as Living Lockets to tell whatever story you choose. Perhaps you want to honor a loved one, perhaps you want to show your faith or just have a reminder of the things you love. With Origami Owl you can do just that – choose your locket style, select the charms that have the most meaning for you and then add in the extras like plates, tags, and dangles. And a great part of Origami Owl jewelry is that you can change your locket as often as you choose too! With an assortment of beautiful locket colors, sizes, and styles plus a great line of chains in many lengths and styles you can easily change the look of your jewelry easily. 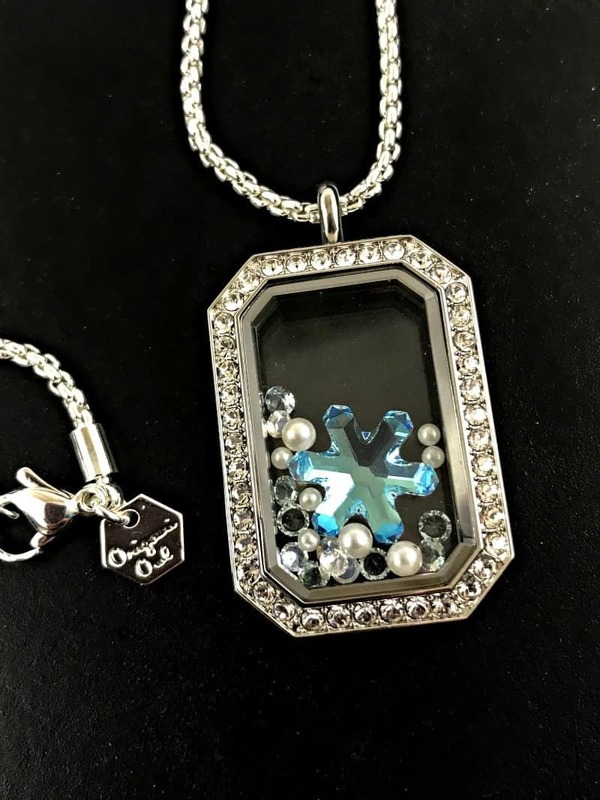 Independent Origami Owl Designer Donelle Haase sent in this gorgeous Heritage Living Locket for inclusion in this year’s Diva Holiday Gift Guide. This bold sparkly locket can hold between 7-10 charms to tell your story or celebrate the season – like this one! Donelle included a Limited Edition Swarovski® Snowflake Crystal Locket Figurine and Limited Edition Snowflake Swarovski® Stardust Crystal Pack to complete this sparkling festive look! No matter how hard I try – photos never do justice to these incredibly beautiful pieces! Because there are many locket and chain size options there really is something for everyone. You can shop directly from Donelle’s website, or consider hosting a party to earn fress and discounted products too! I LOVE the way they call their parties “Jewelry Bars” and that guests can attend and sometimes even go home with a ready to wear locket, but they take it a step further and every order is packaged in these adorable little takeout boxes and re-usable “fortune cookie” holders. If you want even more, consider joining Donelle’s team and build your business helping others tell their stories with these beautiful lockets! Check out Donelle’s website to learn all about how you can get involved with Origami Owl!